Emergency workers are searching for some 20 people feared dead after two buses plunged into a river when a road bridge gave way after torrential rain. Two bodies were found in the River Savitri, but rescuers fear the others were swept downstream. The bridge south of Mumbai links the city with Goa, a state popular with tourists. More than 100 rescuers and divers have been searching for survivors but heavy rains have hindered their efforts. No vehicles or survivors were spotted. Disaster management chief O P Singh told AFP: "The flow of currents is very strong, making it difficult to launch a full-scale search operation. We are looking for vehicles and bodies over a stretch of eight kilometres (5 miles)." Rakesh Ranjan of the National Disaster Response Force told the BBC there was no sign of the buses within a kilometre of the bridge and they may have been swept further by the current. 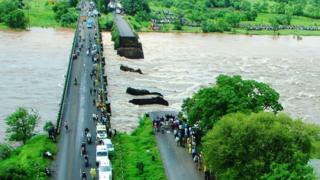 Devendra Fadnavis, chief minister of Maharashtra state of which Mumbai is the capital, said the collapse likely occurred from the heavy rains and flooded river which thrashed the bridge for days. Eyewitness Navnath Mahadev Khandekar, who was working in a restaurant, told the BBC he saw people fall into the river at about 11:30 at night. "We were switching off the lights and closing the restaurant when one of our boys called me and showed me a man drowning in the water. "We could not do anything as we did not have ropes or anything that could help us save him." Safety issues such as lack of inspections and the use of substandard materials have plagued construction in the country. In March, a flyover being built in the city of Kolkata (Calcutta) collapsed, killing at least 20 people and injuring nearly 100. And in 2011, some 32 people died and 132 were injured after a bridge collapsed at a political event in Darjeeling in West Bengal.